The community of Stone City began in 1850 with the discovery of large deposits of limestone along the banks of the Wapsipinicon River. 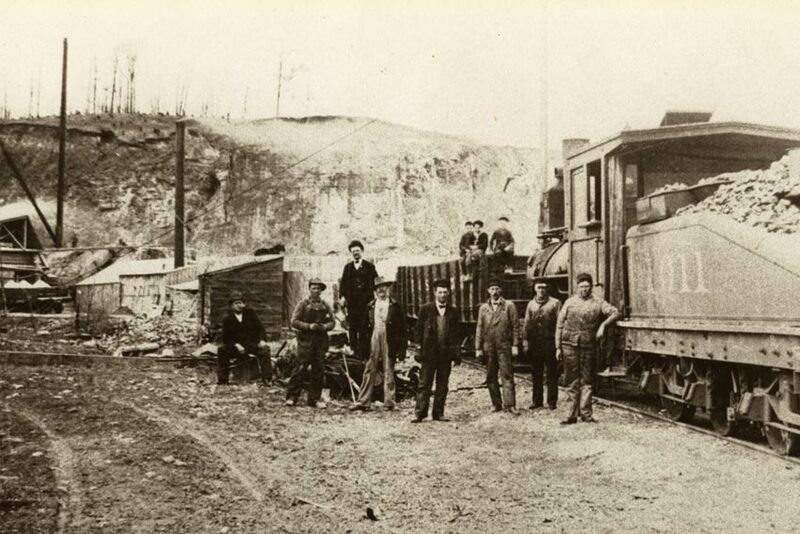 Henry Dearborn and John Green saw the potential of this limestone and developed three quarries using labor from the penitentiary in nearby Anamosa. Their successful business increased the population of Stone City from 60 to 500 by 1880. In the 1890’s it is reported that over 1,000 people lived in Stone City. The majority were quarry workers earned an average of 15 cents an hour. By the early 1900’s the advent of Portland cement had an adverse effect on the economy of the Stone City quarries and one by one they began to close. During the next half-century, nature reclaimed most of the quarries. In 1952 the quarries underwent economic revival under a new owner. The quarries have continued to grow and today and Weber Stone Company has become one of the largest limestone quarries in the Midwest and their stone is shipped all over the United States. The stone from the banks of the Wapsipinicon can be seen in both old and new construction. More recently it was used in construction of the Disney Concert Hall in Los Angeles. Buildings in Iowa include those at Cornell College, the Iowa State Capitol and the State Penitentiary in Anamosa.